Indra Nooyi acknowledged that it is difficult to maintain a work-life balance. NEW YORK: PepsiCo’s India-born CEO Indra Nooyi, counted among the world’s most powerful women, acknowledged that it is difficult to maintain a work-life balance and women cannot “have it all”, saying she doubts that her daughters think she was a good mother. “I don’t think women can have it all. I just don’t think so. We pretend we have it all. We pretend we can have it all,” 58-year-old Nooyi said in frank remarks at the Aspen Ideas Festival in Colorado this week when asked if she feels whether women can have it all. Nooyi, who is regularly ranked by Forbes and other publications as among the most powerful women in the world, said she has died “with guilt” several times as she tried to bring up her two daughters with her husband of 34 years. Nooyi recounted that she felt guilty for not being able to attend several activities at her daughters’ school as she could not take time off from work. “...every day you have to make a decision about whether you are going to be a wife or a mother, in fact many times during the day you have to make those decisions. And you have to co-opt a lot of people to help you. We co-opted our families to help us. We plan our lives meticulously so we can be decent parents. But if you ask our daughters, I’m not sure they will say that I’ve been a good mom. I’m not sure. And I try all kinds of coping mechanisms,” she said. The times that Nooyi could not be there for her daughters, “I would die with guilt,” she said, adding that gradually she learnt to cope with the situation. “...you have to cope, because you die with guilt. You just die with guilt. My observation... is that the biological clock and the career clock are in total conflict with each other. Total, complete conflict. When you have to have kids you have to build your career. Just as you’re rising to middle management your kids need you because they’re teenagers, they need you for the teenage years,” Nooyi said. “And that’s the time your husband becomes a teenager too, so he needs you. They need you too. What do you do? And as you grow even more, your parents need you because they’re aging. So we’re screwed. 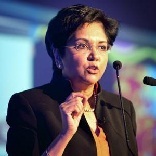 We have no...we cannot have it all,” said Nooyi, who is the fifth CEO in PepsiCo’s 44-year history. Nooyi also recounted the day 14 years ago when she was told that she would be made president of PepsiCo and be named to the board of directors.